Description The Bell 212 Twin Huey is a medium-weight, two bladed, double turbine helicopter. It is a stretched development of the 205 model and uses two turbines (Twin Pac) to drive a common gearbox. 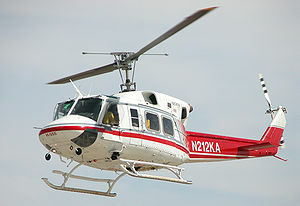 The Bell 212 Twin Huey is a medium-weight, two bladed, double turbine helicopter. It is a stretched development of the 205 model and uses two turbines (Twin Pac) to drive a common gearbox. Do you want to comment the Bell 212 helicopter?